It’s been a while since Zulily has offered a sign up bonus and this is a great way to pick up an inexpensive gift! Get a FREE $10 credit when you set up a new Zulily account thru November 16th. Although the credit can’t be applied to tax or shipping (starts at $5.95), they do have lots of items for around $10. 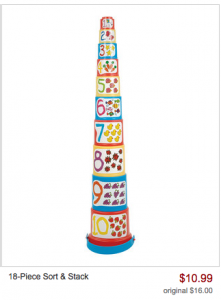 Grab the cute Battat stackable toy above for $6.94 shipped after your credit!